How to Make Money in Facebook Buy & Sell Groups! Warning: BUYING AND SELLING ON FACEBOOK IS ADDICTIVE! I recently joined one of the popular Facebook Buy and Sell Groups that are popping up all over the place and have been loving it! 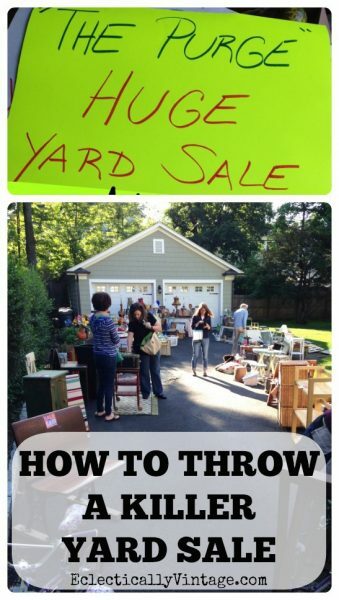 It’s an easy way to sell unwanted stuff to people that live nearby. In one week, I listed a pair of pillows, two terracotta strawberry pots, a floor lamp and three French platters. Cha-ching – yes that’s $120 burning a hole in my pocket just by getting rid of stuff that has been gathering dust in my house. Bonus: my hubby is thrilled I’m letting go and cleaning out the clutter! I’ve been learning to let things go to create a calmer less clutter filled home (read my Decluttering Tips) and the extra money is a bonus. 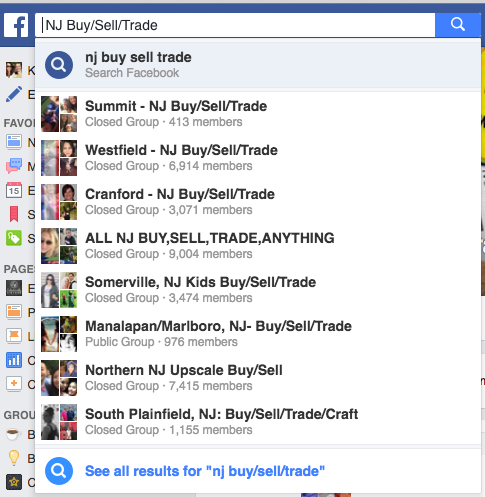 I did a search for “NJ Buy Sell Trade” or “New Jersey Buy” or “my town sell”, etc. Try searching multiple ways and matches should pop up. Click on them to learn more and ask to join groups that are a good fit. Not finding a group in your area? You can always start your own and spread the word to your local friends. Most groups are closed which means you have to ask permission to join but many will have a description for you to read the rules before joining. Some limit the amount of posts, some only want certain items (one of my group excludes kids stuff and personal items – it’s solely for household goods and furniture). Some groups are larger than others (one of mine has over 4,700 members) and the bigger the group, the more likely your things will sell quickly. (Can’t part with your stuff? 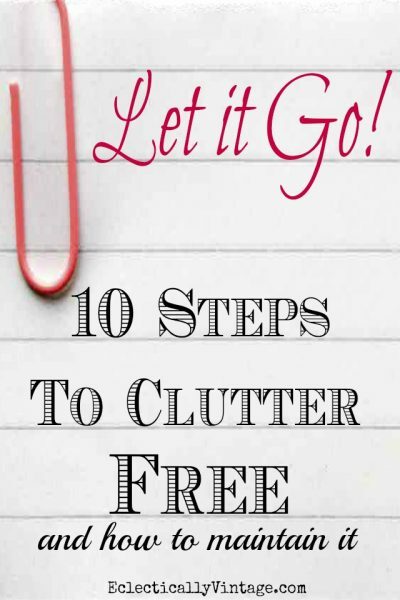 Start with my Tips for Letting Go and Decluttering Your Home). Using Cell Phone: make sure you have the Facebook app on your phone. Take photos then share to your Facebook page. 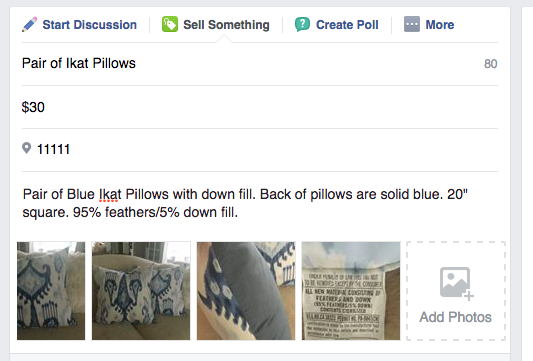 Click on your name, then click on Group and choose the buy/sell group you want to post to. There you can add your description and price. Using Computer: Go to your buy/sell group and click “sell something” then add title, price, zip code, description and finally upload photos then click done. Include important information including measurements, age, any damaged areas and price. Cell phone pics are fine just make sure they are clear and bright with minimal stuff in the background. Take close ups of details, important markings and damaged areas. My goal is to clear the clutter while making some extra cash so I price things fairly. I think 1/3 of the retail price is a great starting point (remember people want a bargain). I suggest downloading the Facebook app to your phone and turning on notifications so you can easily answer questions from buyers. In my group, if someone is interested, the seller will leave a comment on the post letting the interested buyer know they sent them a direct message so they can work out the details. Because these people aren’t your FB friends, sometimes their Direct Messages will go to your “Other” folder so remember you might have to search for it. Some people prefer pick ups at their house while others prefer a public place like a busy parking lot. Choose what works for you and be safe! Once it sells, make sure to go back in and mark it as sold or delete the post. Craigslist – you’ll have access to a larger audience but it is more time consuming to post. eBay – great for expensive collectibles or one of a kind items but you’ll have to pay shipping charges and fees. Now I’m off to find more stuff to sell (and maybe find a few bargains to buy)! I belong to 6 Facebook groups for buying and selling. Two are shopping channel related items, 2 are for specific big name jewelry items, one is a clothing item, and another is an auction twice a month. I have bought and sold and continue to use ebay also. It is a fun way to make money without paying fees. Wow – 6 groups! I like the auction idea! Thank you! I’ve used Craigslist and others. Had no idea about this especially since I try to stay off FB. This is a good reason to go back on. I just found my bluffton sc buy and sell group and joined, great post! We have a FB page here in my little town and it seems fairly busy. It’s fun to see what people will try to sell (like old bras or bad craft projects). I’m thinking of putting some things on it, since I definitely need to de-clutter! We have a small police department which is just off the main road and it seems to be a good place to meet for safety reasons. old bras! but I definitely have some bad crafts projects gone bad!! I belong to 3 groups and it is pretty great. Thanks Kelly. Looks like I’m late to the party – oh well, better late than never!! I haven’t tried this yet. I have sold a few things on Ebay but have some large things that this might work for. I am definitely going to check some groups out in my area. Thanks, Kelly! Funny that I am just reading this post at the same time that I messaged my friend to ask how she is doing with her listed items. She has made over $500 in just a month with little odds and ends that she wants to move on. I am going to try this asap. I always enjoy your blog! It’s amazing and like you said it’s getting rid of stuff we’ve moved on from! I created Cajun Swap Shop for the purpose of the same. We had no decent ones in the area. We are 237,000 strong and growing . Very fun to see the many items and to sell and trade as well. I just donated all of my China. I like my every day dishes better anyway. Hooray for me! I didn’t ask for formal china when I got married – I’m a casual dish kind of gal too! How about new marketplace feature. I think it’ll most likely kill Groups, so admins of these groups will have to discontinue the maintenace or shut down their groups. Your thoughts on that? Facebook marketplace is bad about marking my items as spam and I don’t understand why. They are legit items that meet their guidelines. Weird – do you post tons at once?